Daniel Clive Wheldon (born 22 June 1978) is an English auto racing driver. He was the 2005 Indy Racing League IndyCar Series champion, and winner of the Indianapolis 500 in 2005 and 2011. Wheldon is nicknamed "Difficult Dan" in the IRL pit lane for his choleric temperament. Wheldon, who was born in Emberton, near Olney, Buckinghamshire, United Kingdom, took up karting at the age of four with funding from his father, he progressed through the junior ranks of motor racing during his school years. Attending Bedford School until he completed his GCSEs at age 16, he frequently took time off to race. During his early career in open wheel racing, he developed a rivalry with Jenson Button before ultimately leaving the United Kingdom to race in America. The reasoning behind the move was that the level of investment needed to fund his racing career in the UK wasn't able to be provided by his family. Moving to the United States in 1999, he spent several years in lower open-wheeled circuits like the U.S. F2000 Championship Series, the Toyota Atlantic series and the Indy Lights series. In 2002, Wheldon moved up to the IRL IndyCar Series for two events, with Panther Racing as teammate to Sam Hornish, Jr.. The following year Wheldon joined Andretti Green Racing, taking the spot of Michael Andretti following his retirement, and collected league Rookie of the Year honours. In 2004, he won his first IRL race at Twin Ring Motegi in Japan, ultimately finishing as runner-up to teammate Tony Kanaan in the championship with three wins. He won the 2005 Indianapolis 500 as well as that season's IndyCar Series championship. His six victories in 2005 also broke the record for most victories in one season (under IRL sanction), previously held by Sam Hornish, Jr. with 5. His win at Indy was the first for an Englishman since Graham Hill's triumph in 1966. In November 2005, it was announced that he would be driving for Chip Ganassi Racing in the IndyCar Series in 2006. Shortly after his first test with Ganassi, he won the 24 Hours of Daytona endurance sports car race with Ganassi teammates Scott Dixon and Ganassi NASCAR driver Casey Mears. He began the IndyCar season by beating Hélio Castroneves by 0.0147 seconds at a sombre Homestead-Miami due to the earlier death of Paul Dana in a practice session. Wheldon retired at St. Petersburg thanks to contact with Sam Hornish, Jr. during a caution period. At the end of the 2006 IndyCar season, Wheldon and Hornish were tied for the lead with each driver having 475 points. In the event of a tie, the driver with the most wins for that particular season is declared the champion. Hornish had four wins for the 2006 season, to Wheldon's two; therefore Hornish was declared the 2006 IndyCar champion. During the close season he was offered a place in the BMW Sauber Formula One team, but declined on discovering he would not be assured a regular drive. "I do want to race in F1. When my contract expires with Chip, I’ll take a serious look at Formula One". Commenting in 2007 on the perception of him as 'difficult', Wheldon said "I put everything into my racing, and I expect the same back. If I see people who aren't giving it I'm not afraid to say so, but that sometimes comes out a little brash. That could be improved a little bit. On 22 June 2008, his 30th birthday, he took his 15th career victory in the IndyCar Series after winning the 2008 Iowa Corn Indy 250 over Hideki Mutoh and Marco Andretti. He donated his winnings to help the victims of the recent tornadoes and flooding which had occurred in Iowa. Wheldon was released from his drive at Ganassi on 2 September 2008. He was replaced by Dario Franchitti; "I have enjoyed these last three seasons with Target Chip Ganassi Racing, but will be moving on to pursue a very exciting opportunity for 2009," Wheldon said. It would later turn out to be a return to former team Panther Racing. Wheldon drove the Panther car to a second place finish in the 2009 Indianapolis 500, the second Indy 500 runner-up finish in a row for the team. However, his strong start to the season faded and Wheldon failed to crack the Top 10 in 7 of the last 8 races of the year. The following year Wheldon again showed strong at the Indianapolis Motor Speedway, finishing second at the 2010 Indianapolis 500. This gave Panther it's third straight runner-up finish at Indy. This time, Wheldon remained competitive all year, challenging for wins on the oval tracks. Despite strong showings in the Panther Racing #4 car, Wheldon still failed to win a race during his time with the team. 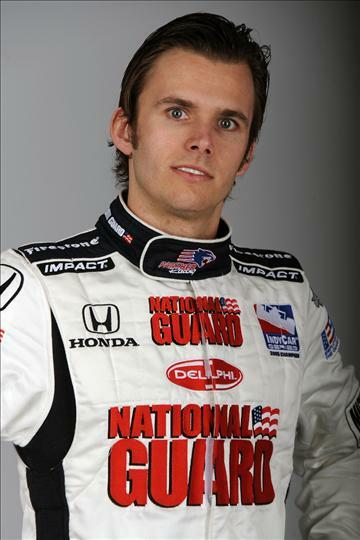 This led to his being replaced at Panther Racing by the young American driver (and 2009 Indy Lights champion) J.R. Hildebrand. Wheldon attempted and won the 2011 Indianapolis 500 with Bryan Herta Autosport in stunning and ironic fashion after inheriting the lead with metres to go after Hildebrand wrecked going into the final turn trying to get around the decelerating Charlie Kimball with too much velocity. Wheldon was very emotional after the win, due to not having a ride for the rest of the season and concerning his mother who had recently been diagnosed with Alzheimer's Disease, to whom he partially dedicated his victory. It was Wheldon's first series win in three seasons.